Blanes (Selva), 1962. Lives in Barcelona (Barcelonès). Graduate in Law from the Autonomous University of Barcelona (1985). Licensed to practice law by the Barcelona Bar Association (ICAB). Lawyer and executive at Winterthur Insurance (1987-2007). Founder of the publishing company A Contra Vent (2008). Director of Foment de Ciutat Vella, SA (2011-2015). Director of the Born Centre Cultural (2012-2015). Director of the Contemporary Issues Study Centre (CETC) (2016-2017). President of Sobirania i Justícia (2010-2011). Member of the governing board of Òmnium Cultural, of which he has been vice-president (2013-2015) and acting president (2015). Member of the permanent council of the Catalan National Assembly (ANC) (2012). Chairperson of the Board of Museums of Catalonia (2015-2017). Advisor for the board of directors of the Exile Memorial Museum (MUME) since 2016. Director of the Revista de Catalunya since 2015. 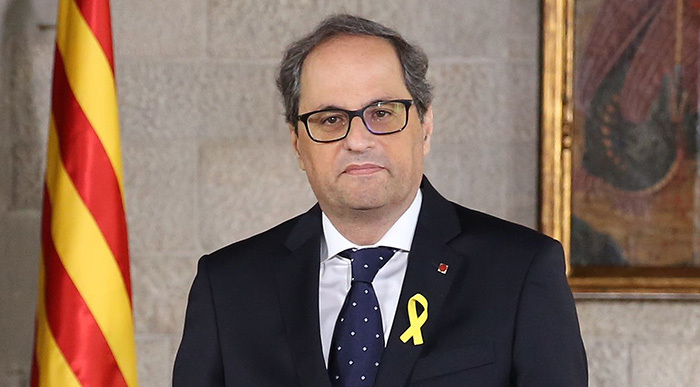 On 17 May 2018, he was sworn in as 131th president of the Government of Catalonia. He has published a dozen books on the history of Catalonia, journalism and biographies and was awarded the Carles Rahola Essay Prize in 2009. Besides being a member of Òmnium Cultural and the Catalan National Assembly (ANC), he is a columnist for El Punt Avui, Nació Digital and El Temps and occasional contributor to the newspaper Ara.